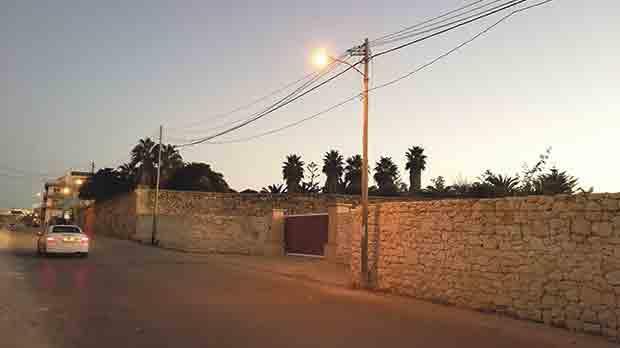 Safi: ‘Develop first, apply and sanction later’: This large ODZ site in Safi opposite the Lidl supermarket has been cordoned off – Charles Polidano has applied to build a villa there. The restricted dimensions of our archipelago do not seem to dent in any way the delusions of grandeur and largesse that the Maltese in general seem to have. In fact, size limitations are constantly brushed aside by proponents of esoteric developments of all kinds, from mega fuel stations to golf courses to the long-touted motor sports race track. I happened to tune in inadvertently to a radio programme last week where the guest was a representative of the local motor sports federation, who was leaving no stone unturned to convince listeners about the reasonable nature of his lobby group’s demands for a new race track. In particular, the representative was downplaying the footprint of the envisaged race track, asserting that the area they needed amounted to just 20 hectares. When the programme host interjected to point out that 20 hectares was equivalent to 200,000 square metres (roughly 22 times the size of the Granaries in Floriana), the representative rebutted by stating that this area was also equivalent to the combined footprint occupied by the National Stadium, Centenary Stadium and training grounds. This outlook is blinkered, to say the least, when assessed strategically within the context of wider land uptake taking place on the islands. For instance, the recently inaugurated shooting range at Ta’ Kandja and the fuel station approval mill come to mind, which collectively would have guzzled another 30 hec­tares of land once all fuel stations come on stream. The question beckons itself: so if availability of land and ODZ desig­nations are (at least that’s what we are told) an issue constraining the development of social housing projects, why don’t the same constraints apply to the motor sports race track, which surely must occupy a lower rung in the ladder of priorities any country has? Both the Labour Party and the PN are inclined to kowtow to the motor sports lobby by pledging to deliver the Holy Grail – i.e. a race track. The government recently announced that it was close to announcing a list of ‘suitable’ candidate sites for the track, with such unilateralism flying in the face of the Environmental Impact Assessment (EIA) process, which should ultimately steer the site-selection exercise. If availability of land and ODZ designations are an issue constraining the development of social housing projects, why don’t the same constraints apply to the motor sports race track? Isn’t the government jumping the gun and jeopardising the auto­nomy of the EIA process through its pre-emptive support for the race track? What if the process determines that all of the proposed sites are non-starters by virtue of their environmental impact? Will the government then backtrack or will the team of experts conducting the EIA have their arm twisted in selecting any one of the candidate sites? The PN has, for the past few weeks, berated the government for failing to reach its air quality and emissions targets. This is a legitimate stance and falls squarely within the Opposition’s raison d’etre. But this concern for our national air quality then quickly fizzles away when the subject of the race track crops up, with the Opposition being resolutely in favour of developing such a track. Are prospective MEPs who have misgivings about the race track intrepid enough to defy their party in publicly opposing this development? If we are to believe that the environment is one of the battle grounds of next May’s MEP elections, then candidates who are very active in the environmental sphere, such as Miriam Dalli (PL) and Michael Briguglio (PN), should declare where they stand on the race track. PD candidates will probably not have any qualms in declaring their own stance. A greater degree of caution should be exercised when pledging the designation of a race track site since ultimately it should be the unbiased EIA process that should have the final say on the matter, rather than politicians. Whatever the electoral cost, our politicians should have the backbone to say no when this is warranted, rather than appeasing all lobbies with a sizeable support base. As if the notorious development of the Lidl supermarket in Safi way back in 2007 was not enough, Charles Polidano (Iċ-Ċaqnu) has applied to construct a villa on an ‘infill site’ right opposite the same supermarket (PA 07692/18), extending over 3,300 square metres by virtue of the ancillary swimming pool and landscaping. The arbitrary ‘infill site’ card is deployed to downplay the site’s ODZ status by giving the impression that the site is already hemmed in by other development, despite being designated as being of high agricultural value. What is even more galling is the fact that the site has already been cordoned off by means of a boundary wall and a gate, as can be observed in the photo accompanying this article, all illegally developed and subject to en­forcement action initiated by the Planning Authority earlier this year, which even extends to other unauthorised works conducted within the site itself. This ‘develop first, apply and sanction after’ is a well-trodden path on our islands, especially by developers who know the ropes well and who view this strategy as the best way to force the PA’s hand. The prospects of the PA rejecting this application and prescribing the clearing of all infringements on site are very remote indeed, despite the approval of this application effectively pushing the Safi built-up perimeter further towards that of Kirkop.